The flowers are still out and the sun still shines in our little haven! People say they feel 'at home' as soon as they enter our home. The warm Santa Fe colours, fir floors, Persian carpets and colourful art exude comfort and relaxation. Our 1914 era home has been redone while maintaining the original character and charm. Our modern kitchen with large island and colourful concrete counter tops is full of art and light ~ perfect for entertaining. The sun-filled open living room with gas fire place has a built-in windowed and warm office space at one end. 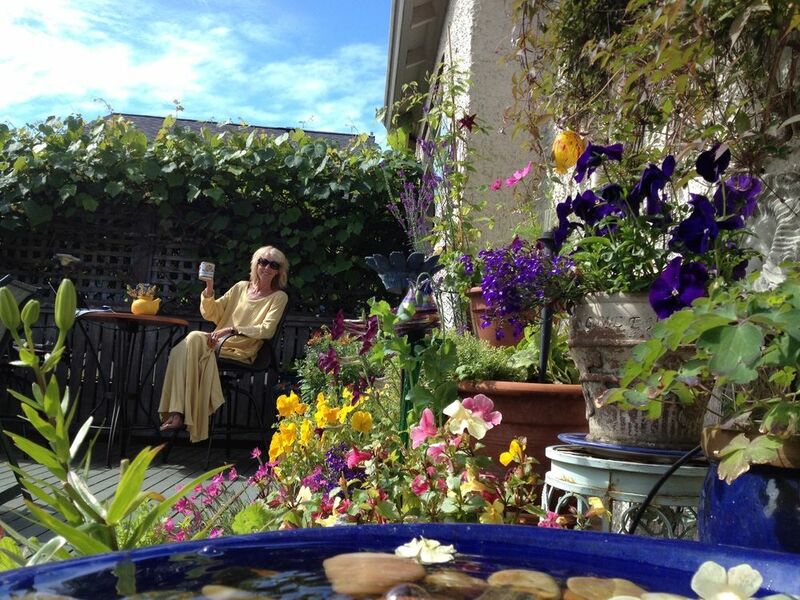 Have breakfast on our sunny, expansive, flowered deck, surrounded by a Mediterranean styled grapevine. Lounge in the private back garden full of flowers and surprises! Our hot tub is the perfect place to completely relax in the evening under the stars. We are on a quiet, chestnut treed street with wonderful neighbours and only 4 blocks to McNeil Bay-a gentle pebble beach to view glorious sunsets over the Olympic Mountains of Washington. Our safe, friendly neighbourhood offers the best coffee bakery delis in South Oak Bay (Demi-Tasse and De'Lish). We are just a 2 blocks from all your shopping needs on charming Oak Bay Ave. which is a foodies delight with delis, bistros, organic produce, cafes, wine shop, pubs and pharmacy. We look forward to hosting you! Pls note: We prefer 30 day rentals! Oak Bay Marina/Turkey Head Walkway Park: l0 minute walk to this multi use island viewpoints, seal feeding or watching from the boat dock, Coffee shop on the dock overlooking the boats and sea, Sushi Bar Dining upstairs or more formal dining in the Marina Restaurant. Old fashioned Double Swings in grass park next door, gentle beach rocks to meander on or picnic or birdwatch from. Sally and Stu were very warm and welcoming. Their house and yard are charming. We ate dinner outside and found it delightful. The house had easy access. Communication was great. We had a lot of fun and got good rest. Oak Bay and Victoria are wonderful. I recommend staying here to all travelers. Thank you. Such a great base of operations that we spent a lot of time at "home!" This was a very pleasant, welcoming place to stay; we recommend it highly. Beautiful art; sunny, colorful, comfortable rooms; inviting multi-deck back yard with flowers and hot tub; gracious hosts. Very different from typical VRBO rentals in which we hope to be able to find extra towels and kitchen basics, etc. We ended every evening in the hot tub (very generous size for our 4-person group), admiring the moon and stars overhead. Everything worked beautifully, from the fully-equipped kitchen to the TV/internet setup, gas grill, etc. Conveniently located for sightseeing and nice neighborhood walks to the shore. We enjoyed our time in Victoria and felt truly at home. Would love to return someday. Gorgeous back garden and deck for having morning coffee . This centrally-located house is definitely a character home with an inviting atmosphere. The owners are very friendly and have been living in the home for 30 years and taken good care of the property. The downstairs have been remodelled, however the upstairs floor boards creaked, which caused a few restless nights for our younger kids not used to these types of noises. However, the house itself was beautiful and easily accessible. All amenities were provided and available in the house which made it very convenient. The local deli (DemiTasse) serves fantastic coffee and food and is walking distance from the home. Delightful space for a family gathering. Bright, spacious, comfortable and clean -- with everything one needs from dishes to dishwasher and a kitchen to cluster in. The hot tub, the backyard and the deck made outdoor socializing possible and memorable. When the weather chased us inside, there was room for all to make music and share laughter without disturbing the neighbors. Convenient to the beach, the park, and Oak Bay Village. Three day stay whizzed by much too quickly and we'd return in a heartbeat. Taxes are included in our fees Extra person fee of 50 per person per night after the first 4 guests.